Energy management and climate change are high priorities at Acadia. In recent years numerous energy management upgrades have been implemented at Acadia significantly reducing our energy consumption and contribution to climate change. The Department of Facilities and Physical Plant Services are responsible for all infrastructure on campus. The Acadia Sustainability office provides support to all departments and coordinates education and engagement programs. 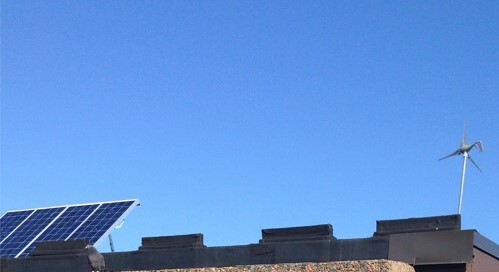 A 400 watt wind turbine and two 200 watt solar panels are installed on the roof of the Students’ Union Building as part of an education project to raise awareness about how renewable energy works and to demonstrate how we can reduce our dependence on fossil fuels and contribution to climate change. Electricity generated from these devices is stored in batteries located in the cabinet by the Horton Avenue entrance. When the television and charging station are in use, power is provided until the batteries are depleted. This project is a partnership between the Acadia School of Education, Ivan Curry School of Engineering, Acadia Students’ Union and Acadia Sustainability Office. 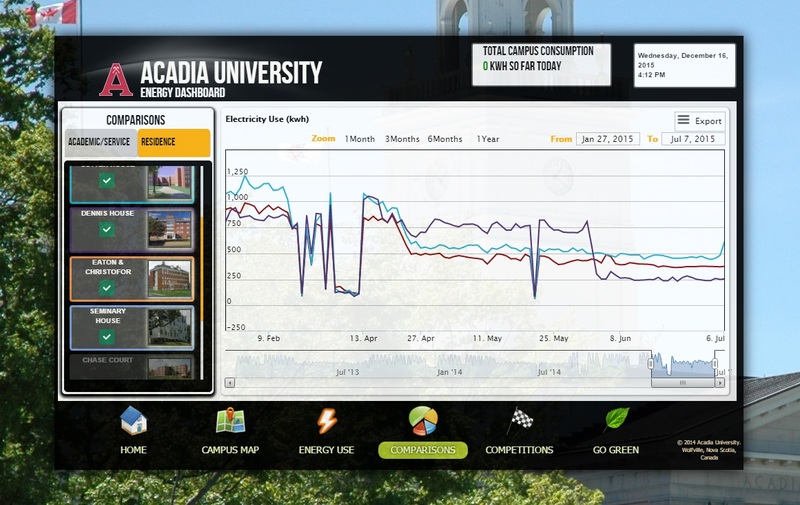 The Acadia Energy Dashboard, developed by the Department of Computer Science in partnership with the Acadia Sustainability Office, Department of Facilities and Physical Plant Services, displays energy use at Acadia in real-time. View building energy consumption over time and compare building performance. The dashboard is best viewed in browsers other than internet explorer. Acadia initiated a holiday energy management program in 2009 to reduce oil, electricity, greenhouse gas emissions and costs over the holiday break when the campus is closed. In addition to HVAC and electrical system modifications in facilities on campus, staff, faculty and students are asked to participate by implementing individual energy conservation measures. Empty, defrost and unplug mini-refrigerators. Close curtains or blinds to reduce heat loss through the glass. Lab managers please close the sash on fume hoods. Turn off research equipment when possible. Set thermostat to 60°F/ 16oC when rooms are unoccupied. 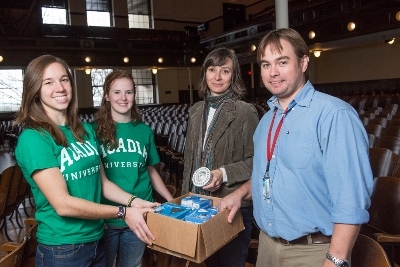 As part of Acadia’s continued efforts to improve energy efficiency another phase of lighting replacements on campus began in 2013. Older CFLs and any remaining incandescent bulbs in academic and administrative offices, student lounges, residences and common areas are being replaced with LED lightbulbs which are 25% more efficient than CFLs and 80% more efficient than incandescent lights. Students are partners in this initiative helping distribute and install new bulbs around campus. In 2015 Acadia converted its heating system from oil to natural gas. This initiative has successfully reduced Acadia's contribution to climate change and improved air quality by reducing GHG emissions and air pollutants such as sulphur dioxide and particulates. Learn more about the campus heating system by visiting http://pp.acadiau.ca/ for an informative slideshow. Too hot or too cold? Wondering how to adjust your office or residence room thermostat? Read the Temperature Controls Guide for instructions on how you can manage room heat. In 2009 Acadia updated the existing tobacco-free campus policy to include both scent-free and anti-idling policies. The new Share the Air requires that motor vehicle operators refrain from idling for longer than 2 minutes while on campus. Polar bear spotted on campus!